During the Google I/O 2011 Googleites we’re treated to a special after hours show by Jane’s Addiction who are getting ready to release a new David Sitek produced The Great Escape Artist album soon. 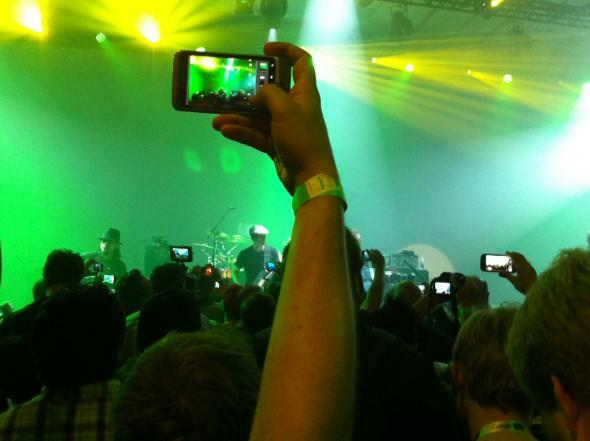 So how did Google employees use their mobile devices to get their rock on? It’s somewhat of an odd show to watch as Farrell and company don’t seem quite in sync, or full of as much energy as they used to have. And I’m wondering why there wasn’t a more relevant or contemporary band chosen for the occasion? Maybe that’s why most of the crowd seems to be more focused on recording the show with their phones than getting lost in the moment of the music. And maybe the fans thought it was a great chance to document a live music relic from the past? I probably would’ve done the same thing too. But what I did take away from this video was the chance to continue our exploration of how mobile is changing the live music experience. Whether it’s a growing trend or not, this is one of the first shows where I’ve seen not only mobile phones popping up like weeds instead of the traditional lighters, but you can also see several tablets and other “iPad-like devices” raised high to celebrate and capture memories of the show. So will we see more fans bringing tablets to shows, or is this just a behavior unique to Googlenation? Have you seen other fans using tablets during live shows? Got a story from this Google I/0 Jane’s Addiction show? Be a good little concert fan and share your experience with the rest of the class.